By publishing a cookbook like no other, instructors at Front Range Community College (FRCC) are teaching peers, students, parents, and others in the community about a situation that has reached a boiling point. Interspersed amid dozens of what the authors call “food bank-friendly concoctions,” the text is a primer in how the Colorado Community College System (CCCS) is slicing, dicing and shredding collegiate-level teaching. Many pages of research, audit charts and budget breakdowns document what the authors say is a recipe for catastrophe for the 163,000 Colorado students looking to those colleges for learning. FRCC has campuses in Longmont, Westminster, Ft. Collins and Brighton. Included are recipe categories such as “The Frappes of Wrath” and “Nobucks Coffee Drinks.” Recipes calling for beef scraps, bruised tomatoes, orange peelings and chicken bones point to a workforce living on the edge. “Cracked Windshield” is a mint drink based on cracked Lifesaver candies. “If Only” is a gin-and-tonic sans gin. “Sliding-Toward-Despair Asian Sliders” are, perforce, small and inexpensive to make. The recipes, say the authors in the introduction, reflect accurately the working conditions of the college’s faculty majority. There is also much humor sprinkled in amidst evidence of hardship and other ponderous but necessary facts adjuncts need to know about why they are experiencing hardship. 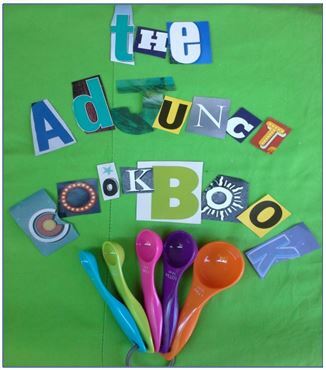 The cheery cookbook, with the word “Adjunct” set in a fun style on the cover, is enticing, if the initial (sold out) print run is any indication. The authors believe that once teachers and students get the books home to read the recipes, they will discover many startling facts about their college. Most of those facts are public information, albeit well-hidden information, about a bloated administration consuming most of the $576 million in CCCS annual revenues. With its many photographs and insights from lawmakers, authors report, readers “will see the faces of good people who know about the situation, will know who is already working hard to set things right, and will join us in addressing the rapidly expanding fault line in higher education.” The book also offers many local resources their AAUP chapter has found to help the adjuncts get through the workweek (food bank locales and hours, local contacts for food stamps, energy assistance, health-care, etc. ).